BEAVERTON, OR – Tektronix, Inc., the world's leading manufacturer of oscilloscopes, introduced the world’s first mixed domain oscilloscope (MDO) that delivers the functionality of an oscilloscope and a spectrum analyzer in a single instrument. 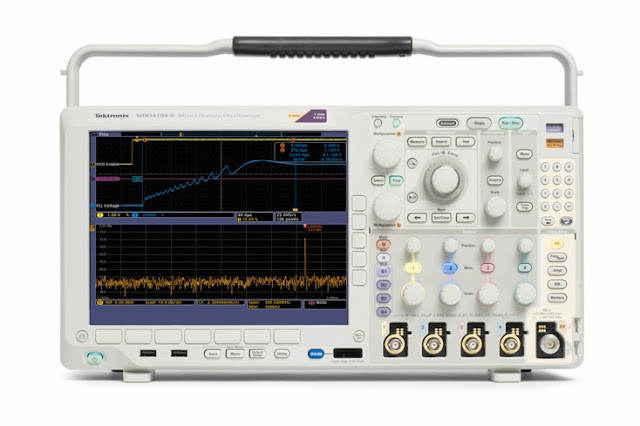 The new MDO4000 Mixed Domain Oscilloscope Series gives engineers the unique ability to capture time-correlated analog, digital and RF signals for a complete system view, helping them to rapidly solve complicated design issues. More than 60 percent of oscilloscope users also use a spectrum analyzer to troubleshoot embedded system designs with integrated wireless functionality, requiring them to work in both the time and frequency domain. Traditionally, an engineer was either a mixed signal/digital engineer or an RF engineer. But with wireless becoming more commonplace, design engineers must often work in both domains. The MDO4000 Mixed Domain Oscilloscope Series is the first oscilloscope ever to integrate the functionality of a spectrum analyzer to provide a unique toolset which will save days or even weeks of debug time. And the MDO4000 goes well beyond typical spectrum analyzer functionality by allowing users to capture time-correlated analog, digital and RF signals across 4 analog, 16 digital and 1 RF channel. The RF input frequency range extends up to 6 GHz and provides a capture bandwidth of ≥ 1 GHz at all center frequencies, 100 times wider than typical spectrum analyzers. Users can even see up to 4 decoded serial and/or parallel buses at one time on the same display. Due to this time correlation between domains, engineers can now make accurate timing measurements to understand delays and latencies between command / control events in their design and changes in the RF spectrum. For example, viewing the spectrum as a VCO/PLL turns on, or measuring the transition characteristics of a frequency hopping RF signal are now simple tasks. And finding the source of intermittent, device-state dependant EMI noise has never been easier thanks to the MDO4000s ability to provide a complete time correlated system view across both domains, something that is simply not possible with today’s test equipment. This remarkable advance in oscilloscope technology is the result of a multi-year research and development effort by Tektronix to overcome the obstacles inherent in integrating the time and frequency domains in a single instrument. Over the course of the development, Tektronix has filed for 26 patents that are pending. To learn more, watch this video on the making of the MDO4000 and the supporting white paper. The MDO4000 Series oscilloscopes will be available globally beginning in late August, 2011. Pricing starts at $19,900 U.S. MSRP. Did you like this? Help to spread the word and share this with your friends on Twitter and Facebook. Wondering what else Tektronix is up to? Stay up to date on Twitter and Facebook.